The CyberData SIP-enabled VoIP Loudspeaker Amplifier provides an easy method for implementing an IP-based overhead paging system. The Amplifier is designed for noisy environments such as warehouses and shop floors. It comes with a moisture-proof NEMA enclosure. The interface is compatible with most SIP-based IP PBX servers that comply with the SIP RFC 3261. For non-SIP environments, the Amplifier can be configured to listen to Multicast address and port number combinations to form paging zones. 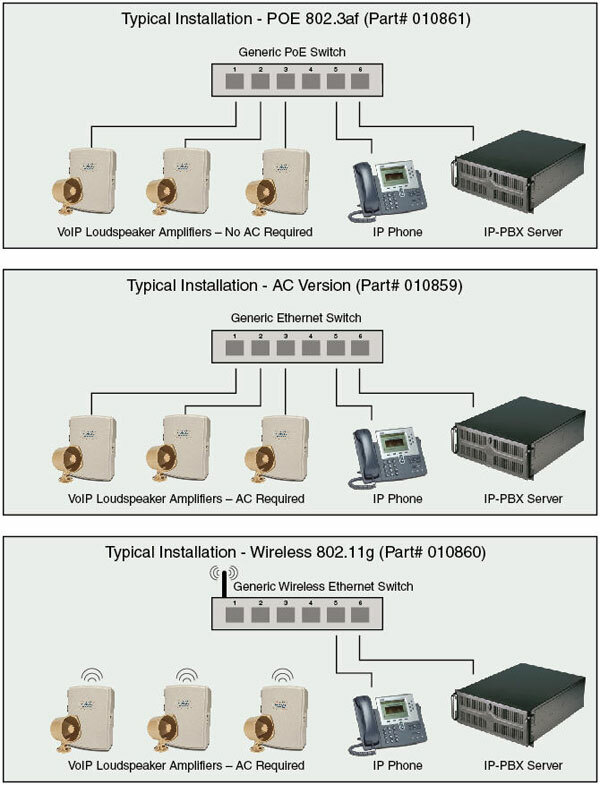 Power-over-Ethernet (802.3af) and a wireless option are available. CyberData recommends good quality speaker wire that is 16 guage and a maximum length of 25 feet. For maximum output, use two 8-Ohm speakers that are wired in parallel with the shortest possible cable length (total combined length should not exceed more than 25 feet). By utilizing the high power jumper settings described in the manual in conjuction with CyberData's PoE Injector, you may achieve additional speaker volume by using either one 8-Ohm speaker or two 8-Ohm speakers in parallel.